Claudia Vyhmeister, Real Estate Agent. Spanish speaker. Specializing in the Counties of Placer, Sacramento, Yolo, Yuba and El Dorado. The role of an executor is to effectuate a deceased person’s wishes as declared in a will after he or she has passed on. The executor’s responsibilities include the distribution of assets, according to the will, the maintenance of assets until the will is settled, and the paying of estate bills and debts. An old joke says that you should choose an enemy to perform the task because it is such a thankless job, even though the executor may take a percentage of the estate’s assets as a fee. The following issues should be considered when choosing an executor for one's estate. Competency: The executor of an estate will be going through financial and legal documents and transferring documents from the testator to the beneficiaries. If there are legal proceedings, the executor must make all necessary court appearances. There is no requirement that a testator has any financial or legal training, but familiarity with these areas does avoid the intimidation felt by lay people, and potentially saves money on professional fees. Trustworthiness: The signature of an executor is equivalent to that of the testator of an estate. The executor has full control over all of an estate’s assets. He or she will be required to go through all of the papers of the deceased to confirm what assets are available to be distributed. The temptation to transfer assets into the executor's own name always exists, particularly when there is a large estate. It is important to choose a person with integrity who will resist this temptation. It makes sense to utilize an individual who is an heir to fill the role to alleviate this concern. Availability: The work of collecting rents, maintaining the property, and paying debts can take more than a few hours a week. Selecting an executor with significant obligations to work or family may cause problems if he or she does not have the time available to devote to the task. If an executor must travel great distances to address issues that arise, there will be more of a time commitment necessary, not to mention greater expenses for the estate. Family dynamics: Selection of the wrong person to act as executor can create resentment and hostility among an estate’s heirs. A testator should be aware of how family members interact with one another and avoid picking someone who may provoke conflict. Even the perception of impropriety can lead to a lawsuit, which will serve to take money out of the estate’s coffers and delay the legitimate distribution of the estate. How to make a video a edit in your smartphone. How to make a video and edit it in your smartphone. What hardware do you need? What software do you need? If your cellphone has a camera probably you can shoot a video with a Selfie stick to hold your phone. There are a few options from a simple $9.99 stick to a $19.99 tripod and remote bluetooh all in one piece. The first hands free bluetooth selfie stick that comes with a tripode inside, so no need for a separate tripod. With a dirty lens you get a poor quality photo; so, clean your smartphone lens before taking any pictures or videos. Start with the exposure, which controls the image’s brightness. You can find the right exposure and lock it. Light: You want the light on your face. See position your lights in the reference below. It can come from a window or artificial lights; just remember, soft light smoothes the complexion and softens wrinkles. Check the reference if you would like to know about hard and soft light. Sound: The cell phones have a built-in microphone that is pretty good if you are positioned close to the camera. As you move away, the sound has an echo. CAN (California Association of Notaries) is the state's #1 web site dedicated to the professional notary public. This site is dedicated to serve notaries with education, supplies, opportunities, signing agent tools and up to date notary news. Start marketing yourself today for all signings in the California market. Sign-up for increased signings now! Whether you are a mortgage company, title & Escrow Company, signing agency, a hospital or an individual, our mobile notary and loan-signing agent database provides full assistance for all your notary signing needs. This is a complete guide to locate a notary public in your area. Our goal is to provide the "Best of the Best”. This loan signing agent and notary mortgage signing services database was created to assist those who use professional and experienced notaries. Our notary database is designed to make it easy to find a mobile notary anywhere in California quick and easy. Sign-up today at no cost and start your search. This California notary database was created to assist individuals, mortgage companies, banks, title & escrow companies, brokers, signing companies and other businesses who use professional and experienced notaries. Guide to find a notary public, mobile notary, traveling notary, signing agent, or notary services in your area to get your documents notarized and get your notary jobs done. Our data is always current and listings are edited daily. If you are a mobile notary public or signing agent, 123notary.com provides highly effective online advertising for notaries. We also offer a wide variety of loan signing courses as well as two loan signing agent certification tests. Additionally, 123notary.com has a wealth of mobile notary public resource materials and books specific to your business needs as a mobile notary. After 22 years California Notary fees will increase. An act to amend Sections 8211 and 8223 of the Government Code, relating to notary public. \Approved by Governor August 17, 2016. Filed with Secretary of State August 17, 2016. LEGISLATIVE COUNSEL'S DIGEST AB 2217, Hadley. Notary public: service fees. Existing law authorizes the Secretary of State to appoint and commission notaries public in the number that the Secretary deems necessary for the public convenience. Existing law prohibits fees charged by a notary public for certain services, including taking an acknowledgment or proof of a deed, from exceeding specified amounts. This bill would increase those amounts, as specified. Some of them are: For taking an acknowledgment or proof of a deed, or other instrument, to include the seal and the writing of the certificate, the sum of fifteen dollars ($15) for each signature taken. For administering an oath or affirmation to one person and executing the jurat, including the seal, the sum of fifteen dollars ($15). For certifying a copy of a power of attorney under Section 4307 of the Probate Code the sum of fifteen dollars ($15). There were 38 votes in favor and 1 against(Senator Janet Nguyen). A justification for this increase may be the cost of living has increase 60% in the last 22 years. According to the Bureau of Labor Statistic’s inflation calculator, $10 in 1993 has the same buying power as $16.56 in 2016. Post Your Free clasifieds. Sell or promote your products. Lots if listing categories. List your service, business. Have summer discounts? Coupons? Publish your ad for free. Geotarget from New York to San Francisco to sell or buy. Right to cancel a refinance loan. When a borrower signs a loan the package includes the form: Right To Cancel, also known as the Right of Rescission. If you sign today, you will have 3 business days to cancel or keep the loan. The document has 2 dates. The first is the date of signing. The second is the rescission date(or the last day to cancel) which happens 3 days counted from the day after the signing occurred. 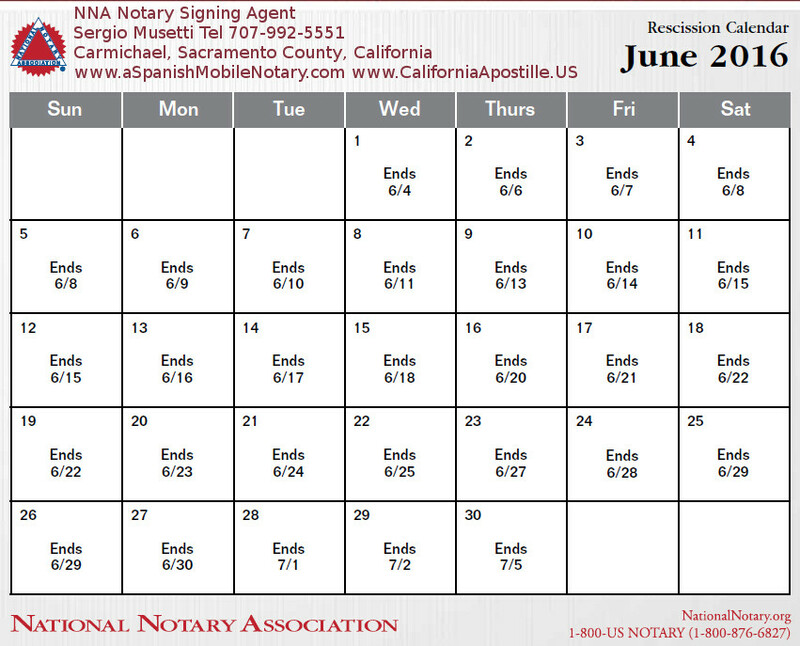 There are calendars that helps the Notary Signing Agent, lender, bank, or the agent drawing the loan package to determine that day. Below is the calendar I use from NNA. Apostille Service in California. Servicio de Apostilla y traduccion. Carmichael Spanish Notary. The National Notary Association mentions why a background check for Notary Public Signing Agents is necessary. "Why do I need to participate in a background screening? In order to guard borrowers' private financial information, the mortgage industry requires all persons involved in the lending process to undergo background screenings. Lenders in turn instruct title services companies to ensure that everyone with access to mortgage documents has been screened. This requirement applies to everyone handling loan documents, including Notaries who act as Signing Agents." Notaries talk about issues regarding the background check. Read or ask questions at the Notary Rotary forum, Notary Cafe forum, or 123Notary Forum. Some companies ask you for a background check, some others don't. So call them and ask their policies, will they give you higher fees, how secure is your information in their hands, will they accept background check from recognized companies? 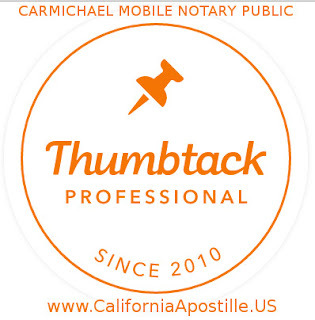 Carmichael, Sacramento County, bilingual Notary Public, Apostille service in California, Spanish Translation. World Trade and Industrial Enterprise Ltd. is an international advisory firm offering a wide range of consulting services to the worldwide business community. We have created the first global on-line "worlddirectory", which will enable you to get in contact with businesses all over the world. This unique Directory is to help small and medium sized companies in their transition to become a global goal. The data base is huge and contains all our experience and connections gathered over the years and it is easy to use. With the Overstock database, WTI is offering a platform that is showing excess inventories from companies all over the world. Consumer items, raw materials or services can be viewed and are at your disposal. For the victims of globalisation we have established "WTI Help and Care Foundation", a non profit organisation that is to bring help and relief in an efficient and fast way to those people in very bad need. Please visit our website. Search, sell or buy your products or services. Online webcam notarizations are invalid and illegal activities for California notaries public. California notaries public should beware of misleading information from private companies claiming to have legal online notarization websites and legal online notarization services. Web-based platforms that purport to allow a person to submit copies of identification over the Internet and to use a webcam in lieu of a personal appearance in front of a notary public (e.g., appearance via webcam) do not meetthe requirements for notarization by California notaries public. Ultimate software for mobile Notaries. If you are a general traveling Notary or a Notary Signing Agent, this tool will help you. Save $100's or even $1000's on your taxes. Did you know that the fees you collect for performing notarial acts are not subject to Federal Self Employment Tax (15.3%), whereas the rest or your net income is? And if you're not reporting this amount to your accountant (or tax preparer), then you are throwing away $100's or even $1000's of dollars each year. NotaryGadget tracks your notarial fees separate from the total amount you charge for each signing and reports them on your Tax Report to make sure you aren't paying self employment tax on that portion of your income. 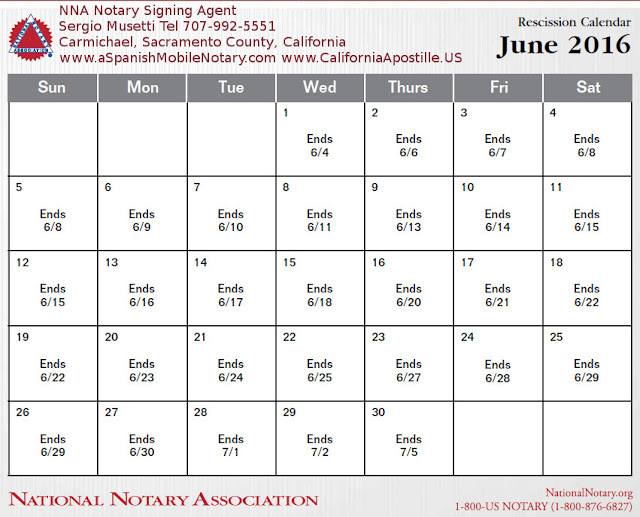 EXAMPLE: Let's say that on average you perform 2 notarial acts per signing and the maximum amount you can charge in your state is $7 per notarial act. Now let's also assume you do 8 signings per month on average. That comes to $1,344 of notarial fees per year. That means that $1,344 of your net income would not be subject to the Federal self employment tax of 15.3%. If you were using NotaryGadget, you would save $205 every year ($1,344 x 15.3%)! Save a ton of time. We recently conducted a survey where we asked our users how much time NotaryGadget saves them. The average amount reported was 2.2 hours per week. That means that NotaryGadget users, on average save over 114 hours of work each year. How will you enjoy your 114 hours of extra time? Your first 15 signings are on us. 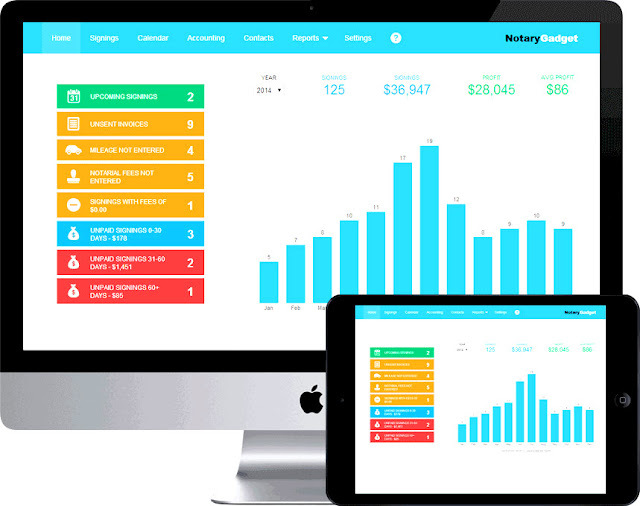 You can send invoices, track your payments, log your mileage, sync your calendars, and do all your accounting completely free with no strings attached - we won't even ask you for a credit card. After your free 15 signings are done, you can choose the plan that works best for you. Although, we do give you a nice discount if you decide to purchase the 1-Year plan. Updates are always free. That means that every time we add some new awesome tool to the software, it's completely FREE. You can use NotaryGadget on as many devices as you want, all for the same low price. You can even share your account with your spouse if you want. Tech support is and will always be free. When you need help, we'll always be there for you. You can enter as many signings as your fingers can possibly type. You can even add your past signings, expenses, mileage, and the rest of your data as far back as 10 years, without paying a penny more. I have been using Notary Gadget for years and it's the best tax deductible tool for my business. NotaryGadget is a software program that's custom designed for notaries and signing agents. It makes just about everything you do easier - sending invoices, managing your calendar, tracking payments, recording expenses, and tax returns. Sonoma, Napa, Marin... Notaries, Clive Prasad & Eileen McCooey. Need experienced notaries in Sonoma, Napa, Marin, Solano or San Francisco? Take a look at Eileen and Clive; they provide an excellent service. "Clive Prasad & Eileen McCooey are NNA/Certified, Background Screened, Licensed, Bonded, & Insured Mobile Notaries & Loan Signing Agents with 20 years expertise with all types of Loan Documents - Refinances, Purchases, Sellers, Reverse Mortgages, Helocs. 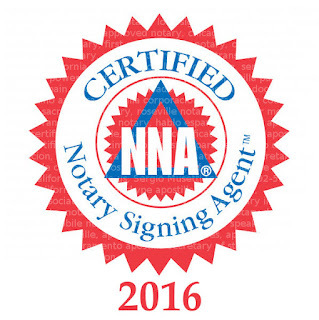 We are APPROVED NOTARIES for Fidelity, First American, Old Republic & most any title company. We travel to hospitals, hotels, retirement homes, offices, banks, escrow offices, or your local coffee house. Carmichael, Sacramento County Notary Public Signing Agent. Notarize documents at your location. Power of attorney, business, legal, personal, financial documents. As a Notary Signing Agent we can help you notarizing documents for refinance, purchase loans, HELOCs, reverse mortgages, conventional loans, FHA, VA, etc. For mortgage brokers, escrow officers, Realtors, title companies, signing agencies, the signings coverage: Sacramento, Yolo and Placer counties. "Our technology is transforming the way people accomplish any project, anywhere, anytime. Just tell us what you need done. We'll quickly deliver customized quotes so you can compare prices, read reviews, and hire the right professional on the spot." Thumbtack. Signing Agent's brochure, California Mobile Notary Network. 2016. 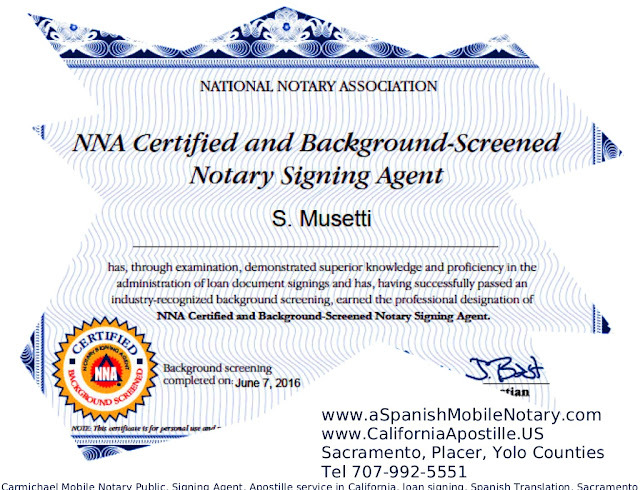 The California Mobile Notary Network is a select group of dedicated, independent, professional notaries public, providing the highest level of mobile document signing services throughout California. 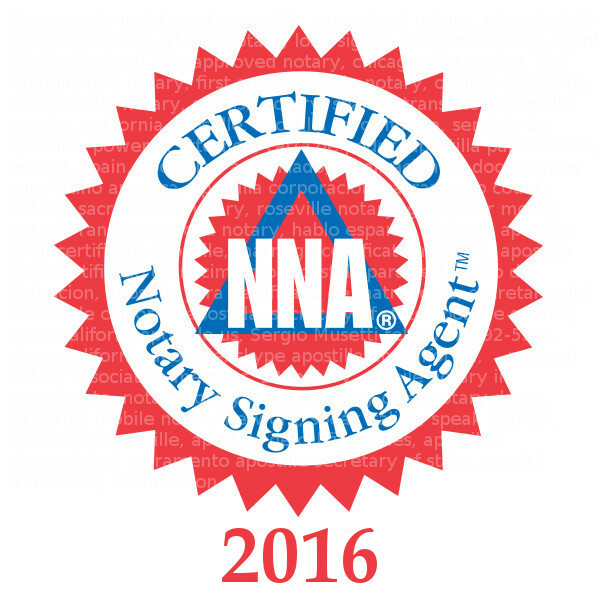 Members of the Network are among the most experienced, knowledgeable and skilled notaries public in the state. When you retain a notary from the California Mobile Notary Network you may rest assured that you are getting the best in the business -- guaranteed. Count on Network members to complete your signings with accuracy, precision and absolute confidentiality. A Notary Signing Agent is a Notary Public who is hired as an independent contractor to ensure that real estate loan documents are properly executed by the borrower, notarized, and returned for processing. A Notary Signing Agent is not an employee of the lender or title company, but acts as a neutral third party to confirm the identity of the signer and assure that all documents are signed correctly. Since state law and lenders often require certain forms to be notarized, a valid Notary commission is essential for persons performing loan document signings. Typically, the Notary Signing Agent contracts with the lender or with a title or escrow company in the transaction to facilitate the signing.